Yesterday, on November 27th, the aggregate market capitalization of all cryptocurrencies altogether exceeded $300 billion for the first time in history. According to Coinmarketcap, at this point, the market cap is around $305 billion. The daily market turnover is over $12 billion. The market has been really booming for a while. For example, the market cap reached $200 billion earlier this month and a couple of weeks later it’s well over $300 billion. 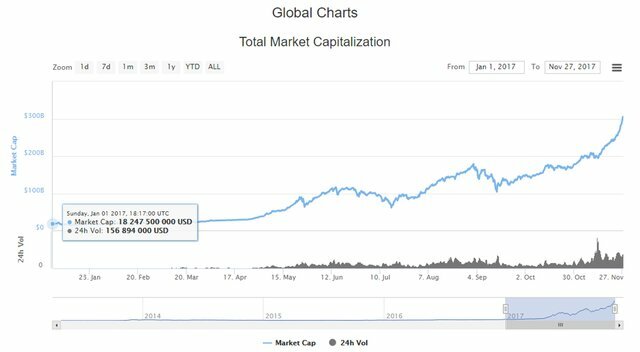 Since the beginning of 2017, the market cap has already grown 16-fold. Apparently, the biggest share of the gain has to do with Bitcoin, the world’s first and largest digital currency. Its market share is now equal to $162 billion. Since the beginning of 2017, Bitcoin’s market cap has already grown 11-fold. NordFX previously reported that Bitcoin had exceeded the $9000 threshold the other day. Now, it has overcome another major threshold, which is $10000. The highest BTC exchange rate is seen on such South Korean exchanges as Bithumb and Coinone. For those of you who don't know, Bitcoin has been dominating the cryptocurrency market ever since begin launched. For now, it’s market share is 53,5%. Bitcoin is also the absolute leader in terms of the daily market turnover – $5,8 billion. At the same time, most other digital currencies have been growing confidently. For instance, Ethereum has gained 7% over the past 24 hours and 25% over the past trading week. The current exchange rate is 490 USD/ETH. As for Bitcoin Gold, which is a fork of Bitcoin (the market cap is $6,3bn) has entered the TOP5 cryptocurrencies. Some experts believe that cryptocurrencies don’t have a ceiling because their mining is limited and as long as more and more people join in, the exchange rate will keep growing higher and higher. This means that Bitcoin reaching $190K-200K is a matter of 10-15 years if not less, they say.